A seemingly innocent scrape on the hand landed Chris Gordon in a fight for his life after it morphed into a serious infection of a flesh-eating bacterium known as necrotizing fasciitis. The morning of March 18, 2017, started like many others for Chris Gordon. "I was helping my wife get our kids into the van for the morning," he says. In the hurry and scurry, Chris scraped his hand on a garage wall. He didn't think much of it at first, but in the coming days, what seemed like a minor injury turned into a major health emergency. The scrape led to necrotizing fasciitis. Commonly known as flesh-eating disease, it's a serious bacterial skin infection that spreads quickly through the body, killing all the soft tissue it finds along the way. To rid his body of the life-threatening infection, Chris would be airlifted from his local hospital to Mayo Clinic and endure several surgeries. But as a result of the prompt and thorough care he received, Chris has returned to his active life. "Basically, I can now do everything that I used to be able to do," he says. "The only caveat is that my right arm doesn't stretch as much as my left arm. But I'm back to running 5Ks, 10Ks and half-marathons, and carrying my kids around. I'm able to do anything and everything I want to again." Initially, there was no sign that Chris' injury would become so severe, and he wasn't worried. "I didn't think anything of it at the time," he says. "I said goodbye, went back in the house, cleaned the scrape as best I could, and started my job as an online teacher." Three days later, Chris woke up in pain and with a large bump on his right elbow. Doctors at a local walk-in clinic told him to keep an eye on it and to let them know if the bump changed in size or became more painful. It did both. 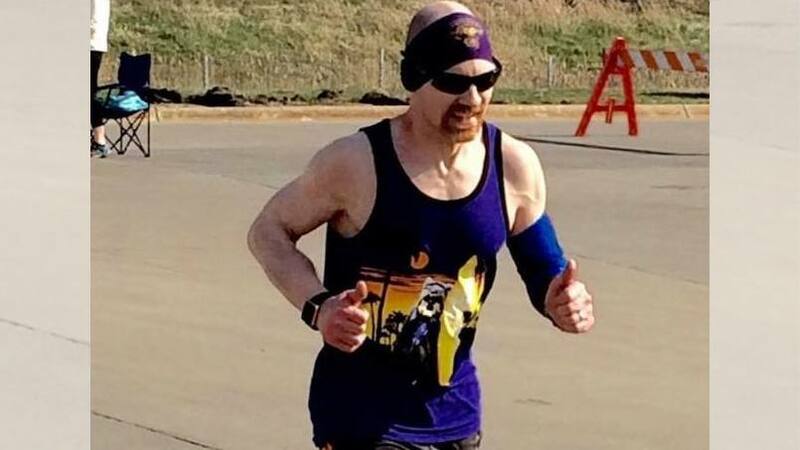 "As the day progressed, the bump became increasingly larger and more painful, and I became much more lethargic, which is uncommon for me," he says. "I'm usually a pretty high-energy guy." By 8 p.m., alarming changes began happening. "My entire right arm and shoulder were twice the size of my left," he says. "Basically, I looked like the Incredible Hulk in mid-transformation." By the time his wife got him to their local hospital's emergency department, Chris says his body had already started to experience sepsis — a potentially life-threatening complication from an infection. "They couldn't even get a valid blood pressure reading on me," he says. "They kept me overnight, and early the next morning they told me there was nothing more they could do. They said this was beyond them." Asked where he wanted to be transferred, Chris' response was short and direct. "I said Mayo Clinic, so they flew me by plane to Rochester that morning." Immediately on arrival at Mayo Clinic Hospital — Rochester, Chris was given pain medication while doctors worked to diagnose what had brought him there. That's when Mayo Clinic orthopedic surgeon Mark Morrey, M.D., joined Chris' care team. "I met Chris in the hallway as he was about to go into the operating room," Dr. Morrey says. "I'd heard about his case from one of my residents. Basically, with the condition we believed he had, we had no time to wait. We had to be aggressive and get him into the operating room or he would have died." The medical team suspected Chris had contracted necrotizing fasciitis. If they were correct, they had to work fast. "I did a quick assessment of Chris in the hallway and then asked another surgeon, Dr. Dave Dennison, to take a look at him," Dr. Morrey says. "His exam was also consistent with necrotizing fasciitis, so the goal of our initial surgery then became to officially confirm that diagnosis." "We had to be aggressive and get him into the operating room or he would have died." — Mark Morrey, M.D. Dr. Morrey took a biopsy from the back of Chris' right arm and sent it to the Department of Laboratory Medicine and Pathology for testing. Tests confirmed it was necrotizing fasciitis. But there was a positive sign. "Dr. Dennison evaluated Chris' muscle," Dr. Morrey says. "There was no evidence that the bacteria had made it into his muscle, and his muscle was not dead, which changed his prognosis considerably." Still, there was much work to be done to rid Chris' body of the life-threatening bacteria. "By the time I got to Mayo, the bacteria had eaten away all of the skin on my right arm down to my hand," Chris says. "And on my hand, which was the original point of entry, it had eaten all the way down to my tendon. All of the skin on my right arm, my right shoulder, most of the right side of my chest and also the right side of my back was gone." Dr. Morrey and his surgical team's first priority was to make sure that the bacteria didn't go any farther. "We started by doing a very extensive debridement (surgical removal of tissue) of the right side of Chris' body," he says. "And when we got up into his chest, we took another biopsy. It looked like he still had viable tissue there, so Dr. (Michael) Bannon recommended we stop at that point. Because of how quickly this bacteria spreads, that was good because if it had gotten up into his chest, his neck wall and into his face, there'd be no way we could have controlled it." Instead, Chris started to show some improvement and began to stabilize. "He wasn't requiring as much pressure support, so we thought we were ahead of the bacteria and had done as much debridement as we needed to do," Dr. Morrey says. "Still, I told the team that if Chris gave even another small whiff of needing additional pressure support again that we'd be taking him right back to the operating room. I'd then have to take off the rest of his skin because it would mean we hadn't yet controlled the infection." The thought of having Chris' treatment potentially come to that would stay with Dr. Morrey for the rest of the day. "I went home that night, and I couldn't go to sleep because I was so worried about him," Dr. Morrey says. Fortunately, that worry would be put to rest later in the night when a resident from Dr. Morrey's surgical team called to say that Chris was doing well. The next day, the main question for Chris' care team became how to reconstruct all of the skin they had to remove to kill the bacteria. For help with that, they turned to plastic surgeon Karim Bakri, M.B.B.S. "When Chris came into my service, he'd basically had all of his skin removed from the back of his hand, all of the way up the rest of his arm, his armpit, shoulder, half of his chest, and half of his back," Dr. Bakri says. "Imagine all you're left with are muscles and tendons. That's basically what he looked like. But that's what needed to be done to save his life." The next thing that needed to be done was to cover his body with skin as quickly as possible. "Imagine all you're left with are muscles and tendons. That's basically what he looked like. But that's what needed to be done to save his life." — Karim Bakri, M.B.B.S. "We had to perform a lot of skin graft and skin flap procedures," Dr. Bakri says. "We also had to do a microvascular reconstruction of his right hand in which we took a large piece of his skin from his left thigh and transplanted it onto his right arm to re-cover all of the tendons and bone structure that allow the hand to work. Just that operation alone took 10 hours because you have to hook up tiny blood vessels. If you're just a couple of millimeters wide, it's not going to work." As meticulous as those surgical procedures were, the postoperative care that Chris required was perhaps even more so. "He required a lot of rehab and close monitoring of the grafts and flaps throughout the first week or so after surgery because they could have died at any stage," Dr. Bakri says. "Our first concern was making sure that everything healed properly, which meant a lot of dressing changes that involved a lot of different people." Those people included Kristen Haack and her nursing colleagues on Francis 2C, General Surgery and Plastic Surgery, at Mayo Clinic Hospital, Saint Marys Campus. "Initially, Chris' care was very similar to that of a burn patient," Kristen says. "He required a lot of extensive dressing changes multiple times a day. It was without question the most severe and extensive case of this kind that we've ever seen." The dressing changes took a lot out of Chris. "They were really hard on him," Kristen says. "And honestly, there was a lot of collaboration and teamwork involved with every dressing change in order to minimize the amount of time Chris' wounds were left open to air. During these dressing changes, he would be freezing cold. We'd have to work very quickly to get him covered back up as soon as we could for his comfort and emotional well-being." Though providing that kind of high-level care and attention may not have always been easy on his care team, Chris says he's forever grateful to them. "The nurses on Francis 2C are fantastic," he says. "I have nothing but positive things to say about them and the rest of my care team. I would not be where I am right now without them." After months of extensive rehabilitation, hyperbaric oxygen and physical therapy, Chris is now back to living the busy lifestyle he loves. And his care team at Mayo Clinic couldn't be happier about his return to good health. "It brings tears to my eyes. It really does," Kristen says. "It makes you realize that as a nurse and a care provider, you literally are saving lives. It's pretty incredible to be a part of that and to see that Chris is doing so well now after everything that he went through." Read about the Department of Plastic and Reconstructive Surgery at Mayo Clinic. Connect with others talking about Necrotizing Fasciitis on Mayo Clinic Connect.